The Nazis came to power at a time of great economic peril in Germany. Unemployment was close to 30%, wages and living standards were in free fall, banks were failing. Germany’s Center Party, led by Heinrich Bruening, had responded to the policy through austerity measures designed to balance the budget and increase investor confidence. These measures failed, costing the Center Party its political legitimacy, and playing into the Nazi narrative that claimed both communism and capitalism were devices of a Jewish conspiracy bent on enslaving Germany. Socialism! That is an unfortunate word altogether… What does socialism really mean? If people have something to eat and their pleasures, then they have their socialism. An actual socialist would probably reply that such a definition could include life under a reasonably generous feudal warlord. Of course, starting in 1933, actual socialists were vanishing from political life in Germany, so it’s likely Hitler never had to hear their answer. The Nazis did promise to reduce unemployment. Toward this end, Hitler’s economics minister, Hjalmar Schacht launched a series of public works initiatives, combined with large tax cuts for producers. Germany began investing huge sums of money in waterways, highways, and, most significantly, rearmament. Munitions expenditures in 1928 were 3% of Germany’s budget. By 1938, they were 46%. By the middle 1930s, Germany’s armed forces were getting more money than they could spend, and most of the productivity gains realized during this time went into accelerating Germany’s rearmament. These policies did help reduce German unemployment, but Germany’s “employment miracle” was also the result, in part, of policies which artificially reduced the size of the German labor force. Women were pushed out of both public and private sector jobs. Meanwhile, those men who refused to take jobs because the jobs paid too poorly or because they considered them too menial for people of their qualifications risked being labeled as “work shy”, which meant a stay in a concentration camp. Also, by introducing conscription in 1933, the Nazis felt justified in removing hundreds of thousands of young men from the unemployment statistics. The consumer sector in Germany’s economy recovered to its pre-depression levels, but not much higher. This was because German wages and prices were not allowed to rise, German factories were devoted to rearmament instead of domestic production, and the German government restricted the flow of imports beyond those needed for heavy industry. The Nazis abolished Germany’s trade unions, forcing German workers to join the German Labor Front, which never functioned as an effective means for workers to bargain for increased wages and benefits. The share of Germany’s income devoted to wages decreased from 64% in 1932 to 59% in 1936. Thus, demand for consumer goods in Germany remained weak, while supply remained flat. These policies led to some fascinating distortions in the German economy. The car industry is an example. The depression nearly decimated Germany’s automotive sector. Four of the remaining twelve automakers in Germany combined to form Auto Union, which functioned primarily as a maker of luxury and racing cars during the early 1930s. US automakers also had divisions in Germany. Ford started manufacturing passenger cars in Germany in 1925, shortly after a relaxation in import tariffs, while GM bought the German carmaker Opel. These two manufacturers competed for middle and upper middle class car consumers in the 1930s, with Opel making a car that, with a sales price about 2000 marks, was almost cheap enough for even the working classes to buy. The Opel Kadett I, almost cheap enough. But Hitler wanted a cheaper car. With that end in view he directed the KDF office (Hitler’s “Strength through Joy” office, which provided cheap vacations and other amusements for Germany’s workers) to design and produce a car whose purchase price would fall under 1000 marks. This car would be called the KDF-Wagen, and working people would be able to pre purchase it by directing 5 marks per week into an account. When the account reached 900 marks or so, the car would be delivered to them. 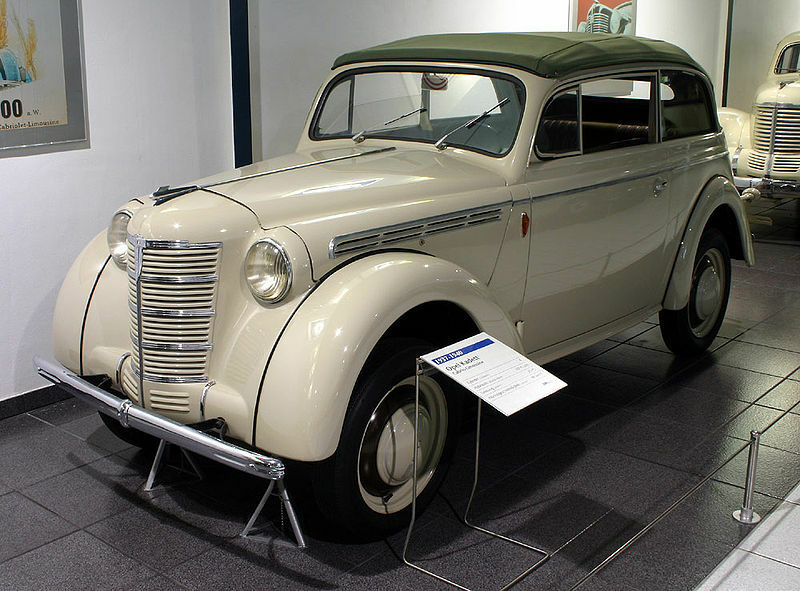 The KDF wagon took several years to design and test, and large factories were built to accommodate demand, but before production could start, Hitler invaded Poland and the assembly lines were turned over to military production. The KDF wagon’s chassis was modified for military use. The worker deposits were either pocketed by Robert Ley, who ran the KDF, or diverted into military spending. No cars were ever delivered. This episode reflects the basic flaw of Hitler’s economic thinking. Hitler was, by all accounts, enthusiastic about the idea of increasing German car ownership rates, and was anxious to build the market; but his commitment to rearmament and his unwillingness to devote resources to raising German incomes made this dream impossible. But, Hitler’s enthusiasms ran to other things than cars, and this gets to the center of Hitler’s vision of economic development. Unlike conventional economists of the era, who saw the depression in terms of currency flight and investor skittishness, or the Keynesians, who saw it as matter of a shortfall of aggregate demand leading to a reduced “velocity of money”, the Nazis felt that Germany’s problems came down to her inability to control her own resources and her dependance on foreign trade, effects exacerbated by Germany’s surrender and the conditions of the Versailles treaty. To solve this problem, Hitler believed Germany needed to conquer and subjugate foreign territory and labor power. In the future, Hitler believed Germany would control enough territory and slave labor power to meet the economic needs of its people. Of course, accomplishing this required a large conventional army with sufficiently advanced weaponry. Hence the need to throw all of Germany’s resources into rearmament. War was Hitler’s economic growth scheme. Note: the statistics in this post come from an article written by L. Larry Liu, an undergraduate at the University of Pennsylvania. His article is worth a read. Those looking for a fuller picture of the German economy during this time should consult The Third Reich in Power by Richard J. Evans. Previous: Previous post: Can Amityville 2: The Possession Be Saved?